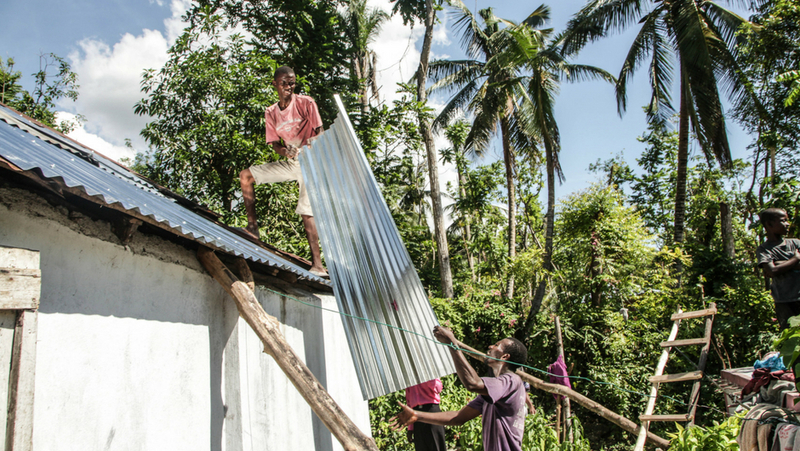 Four months after Hurricane Matthew tore across Haiti as a category four storm, the world’s attention may have moved on to other topics, but Haitians continue to recover and rebuild their communities. Meanwhile humanitarian assistance organizations are now engaged in evaluations of the international response to the disaster. In an effort to continually improve relief efforts to deadly events such as this, it is very appropriate to ask questions like, were donor responses and financial resources adequate? How effective were disaster preparedness plans? Was international aid coordinated appropriately among leadership and was there sufficient accountability to affected populations? The Inter-American Foundation (IAF) is not a disaster relief agency. However in the aftermath of the October 2016 storm the IAF supported its existing networks of grassroots partners to tailor their own emergency social and economic interventions to address the needs of at least 10,000 storm survivors. The IAF continues to support its Haitian partners. In an effort to contribute to the dialogue for improving future relief efforts, the IAF includes some lessons learned in the aftermath of Hurricane Matthew — from the perspective of its grassroots partners who are the most affected when disaster strikes. IAF’s Local Liaison and Administrative Support (LLAS) should make rapid contact with the leaders of beneficiary organizations immediately after a disaster. During follow-up meetings, the members of affected organizations all expressed their gratitude and recognition to the IAF because it was the first organization that inquired about the situation following the storm, according to a member of IAF grantee partner Organisation de Développement Durable et Solidaire D’Haïti (ODDSHA). IAF focal point(s) in the field should organize rapid response visits to assess the individual situation of each groups affected to determine the level of support needed. They should consult with other community members affected by the disaster – not only groups associated with projects financed by the IAF. During evaluation meetings, residents appreciated that the IAF was the first organization to visit the communities to make damage and needs assessments. Even a week after the hurricane, no other authorities had cared to visit their communities. During post-disaster meetings it is important to let the members of all organizations express themselves. Be patient during the discussions. Listen carefully to their frustrations. The IAF’s local liaison noticed that during the first visit after the hurricane, residents wanted to stay longer at meetings. Responders should visit gardens, homes and other destroyed buildings as much as possible. Speak with prominent figures, but not only them. Besides organization leaders, speak also with ordinary members. Talk to women’s groups separately. In certain cases women will not speak frankly on their issues in the presence of men. Mothers will be more willing and most capable to speak clearly about children’s issues. Take into account people’s proposals about how they wish to continue their community activities beyond the short-term. For example, what are their medium- and long-term needs? Avoid proposing solutions to residents and survivors after a disaster. During follow-up visits most organizations thanked the IAF for the strategy used to help people cope and recover from problems caused by Matthew. “The IAF has a lot of respect for its grantee partners. It respects their wishes,” said one ODDSHA member after the response. Facilitate psychological support to survivors. The availability of counseling the IAF offered to organizations that suffered losses has proven to be very important for healing communities. It allowed affected populations to build confidence and strengthened self-esteem. In the immediate aftermath of the storm some survivors thought their lives were finished because their assets had been destroyed. Counseling helped them to regain their confidence and motivation to reinvigorate household incomes. Strengthen solidarity between grassroots organizations by having a brainstorming session with leaders from various groups. At a follow-up meeting with Mouvman Peyizan 3yème Seksyon Kanperen (MP3K), group leaders explained the importance of solidarity and importance of networking. Identify and commend communal work completed by community organizations before intervention. We noted that before the arrival of humanitarian aid, group members had already organized themselves to help survivors and to clean roads to facilitate communication in more remote areas. Take photographs to document damages and needs during the first evaluation visit to the field, and more during follow-up visits. Storm-resistant structures built with IAF funding in two communities in Camp-Perrin played an important role in protecting community members. In the aftermath of the hurricane, MP3K’s facility and that of the Association Planteurs Jonc-Tiby hosted more than 1,500 vulnerable community members. Due to their support, people who are not members of these organizations have a more positive perception of the organizations. Strengthen communication between organizations during the assessment stage. The IAF team in Washington, D.C. keeps regular contact with the team in the field in order to closely align and adapt based on the reality on the ground. Interventions take time. They require a lot of communication with the groups to prepare funding. Encourage organization members to build resilience to extreme weather. Communities that are prepared are less vulnerable.